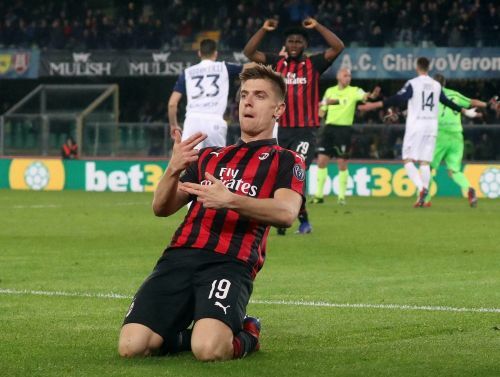 Krzysztof Piatek scored what was to prove the winner. His 19th league goal moved him level at the top of the goalscoring chart with Juventus forward Cristiano Ronaldo and Sampdoria's Fabio Quagliarella. A decision will be announced on Tuesday and will depend on what is written about the incident in the referee's report. "The coach didn't want to talk precisely because of his sending off," said assistant coach Luigi Riccio, who stood in for Gattuso in the post-match news conference. "I just want to say that they have already clarified everything, they talked, and these are things that happen on the pitch." "I don't want excuses but in the last six matches all the VAR decisions have gone against us," Chievo coach Domenico Di Carlo said. "Piatek's move on (Fabio) Depaoli wasn't football, it's kung fu ... you can write the headline: 'Chievo beaten by a kung fu kick.'" The only goal came from a Parma corner which shouldn't have been as the team's forward, Roberto Inglese, made the final touch. From that corner, Juraj Kucka's header was fingertipped onto the bar by former Chapecoense goalkeeper Jandrei, who was making his Serie A debut. Luca Rigoni fired the rebound onto the post from point-blank range but former Genoa forward Kucka turned it in at the third time of asking.